Crantoch Church near Newquay in Cornwall. Painted on watercolour course with Judi Whitton. Holly House in the snow, Steanbridge Lane, Slad, near Stroud Gloucestershire. Inside House of Balconies in Orotova, Teneriffe, Canary Islands. La Chasse is a farm in Tendu a small village north of Limoges in France. The centre of the Cotswold village of Lower Slaughter near Stow-on-the-Wold. Honfleur centre near Le Havre with a fisherman mending his nets in the foreground. Newark Park- Ozleworth A Tudor hunting lodge, converted into a castellated country house by James Wyatt now owned by the National Trust. Rick Stein's Seafood Restaurant painted on a wet day in November to celebrate the previous night's excellent meal. Slad Churchyard caught in an unexpected heavy snowfall in December 1999 near Stroud Gloucestershire. The Swan Inn, bridge and river in the Cotswolds village of Bibury. View from window of Padstow Seafood School down the Camel Estuary, Cornwall. Ruined remains of tin mine (Wheal Basset) at Porthtowan near Redruth Cornwall. 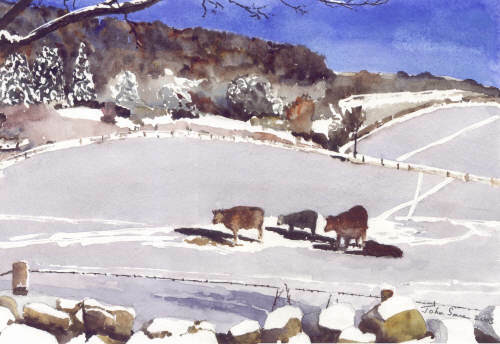 Painted on watercolour course with Judi Whitton.